Laptops are easily the most power hungry essential devices that we carry around. Even though modern laptops now offer 8-10+ hour battery life thanks to low-power processors, SSD drives and high efficiency displays, powering laptops while away from AC outlets still remains a challenge. These have an inbuilt AC outlet in which you can plug in your laptop power adapter. Such powerbanks are extremely inefficient as they involve two power conversion steps – DC to AC in the powerbank and again AC to DC in the laptop power adapter. This dual power conversion wastes a lot of power and as a result such powerbanks suffer from extremely poor power efficiency. Therefore, if your main intended use is backup power for laptops, we recommend not purchasing AC outlet powerbanks. Instead, we recommend purchasing direct DC outlet (USB-C PD powerbanks also output direct DC) powerbanks. AC outlet powerbanks are only justified for providing back up for speciality power equipment that need AC power only as there is really no other alternative. DC output powerbanks have a DC barrel port that usually outputs 19 volt or 20 volt DC power. Some modern powerbanks these days also come with USB-C PD port for laptops that can output variable 20/15/12/9/5 volts power over the USB-C port for laptops. As most laptops use 19/20 volt DC power, this is the most efficient way to power laptops as it eliminates DC-AC-DC conversion step and therefore allows for much greater efficiencies. As DC outlet powerbanks are far superior to AC outlet powerbanks all our picks here are DC Output portable chargers. HP Spectre laptops are one of the most popular laptops around. HP restricts (via firmware) powering these laptops from third-party USB chargers and as a result most regular USB powerbanks fail to charge HP Spectre laptops. However, HP manufactures its own portable charger for HP spectre laptops – HP Spectre USB-C Power Pack 20100 mah – that is perfect for charging all HP Spectre laptops that come with a power brick with 65 watt or less of power output. This means you can charge your 13.3 inch and 12-inch screen HP Spectre laptops (HP Spectre, HP Spectre x360 and HP spectre X2) using the HP Spectre USB-C Power Pack . However, please note that it will not charge the 15 inch screen HP spectre models as they have a higher power draw (90 watt max). 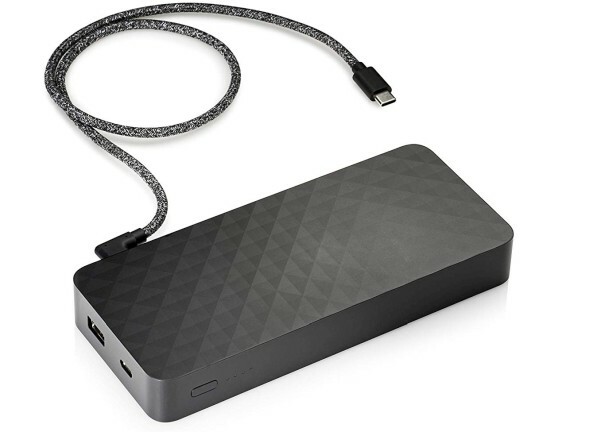 The HP Spectre USB-C Power Pack weighs about .95 lbs (420 grams) and comes with two USB-C ports and a regular USB port for charging smartphones.This portable charger comes with USB-C to USB-C cable and can be recharged over the USB-C cable in about 3 hours with the Spectre 65 watt power brick. The HP Spectre USB-C Power Pack has a 20100mah battery (75 watt-hours). In our tests, the HP Spectre USB-C Power Pack was able to charge a HP Spectre Core i5 13.3 inch screen laptop about 1.1 times, which is an excellent charging performance. Extra USB port for charging smartphones is very useful. These two Dell powerbanks are currently the best options for charging Dell laptops including the XPS and Latitude series laptops. While not exactly as good and efficient as the HP Spectre powerpack, these two portable chargers are currently the only ones that work reliably with the Dell laptops for which they are designed. Dell PW7018LC Notebook Power Bank Plus – USB-C is an 18000 mAh portable charger designed for USB-C laptops drawing up to 65 watt of power. It supports Dell XPS 13 9370 and Dell XPS 15 9570 laptops (does not support earlier 9360 or 9560 laptops). The 18000mAH capacity just about charges the battery of XPS 13 once. 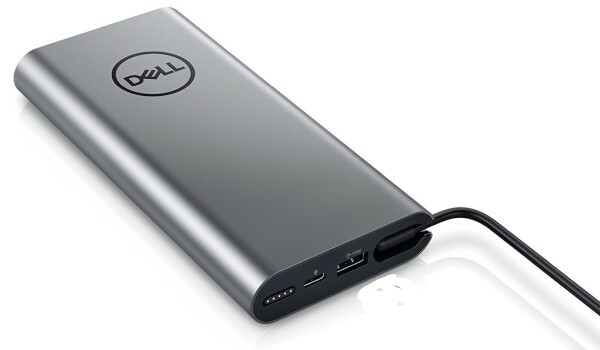 Dell Power Companion 6 Cell 18000 mAh has a conventional DC barrel port output and supports a large range of Dell laptops. It supports Dell Inspiron 5555, 5758, models as well as Dell Latitude 12 Rugged Extreme (7204), 13 7350, 14 Rugged Extreme (7404), 3160, 3350, 3450, 3550, 7214 Rugged Extreme series of rugged laptops. It also supports Dell E5250, E5450, E5550, E5570, E7250, and Dell Venue 11 Pro (5130), 11 Pro (7140), 8 Pro (3845), as well as Dell Vostro 3558, 5459, Dell XPS 13 (9343), 15 (9550) series of laptops. We found charging efficiency of both these portable chargers as decent (though nothing spectacular). These both are 65Wh batteries but in actual tests, they deliver about 36 Wh of charge to laptop batteries. The Dell PW7018LC USB-C charges an 2018 XPS 13 about 80%. Given the lack of any other alternative, these two batteries are still the best portable battery options of Dell owners. Pass through charging – Dell PW7018LC can be charged while it charges the laptop. Extremely handy feature as you can keep powerbank constantly plugged in and topped up. Extra USB port for charging smartphones. Omnicharge Omni 20 is a rather pricey but highly portable and high quality portable charger not just for laptops but also for a huge range of professional equipment ranging from cameras to various field equipment. The Omnicharge Omni 20 has a 20,100 mAH battery and comes with an adjustable voltage DC port for charging laptops and equipment. It also comes with an AC/HVDC port as well for charging speciality equipment. The 20100 MAH battery charges most current laptops about once. Due to its incredible 100 watt power draw support, the Omni 20 will charge a huge range of laptops ranging from Dell XPS 15, XPS 13 to HP Spectre 13, and Surface Pro 4 and Surface Pro 3, as well as Macbook Pros and Macbook Airs. The OmniCharge Omni 20 USB-C weighs about 1.4 pounds and has a compact, rugged build. It gets fully charged in about 3 hours with the bundled power brick. OmniCharge Omni 20 USB-C is the USB-C version, specifically designed to charge USB-C laptops with about 60 watt of power draw. This makes it a great option for charging the latest MAcbook Pros at the highest possible speed (60 watt). No other USB PD portable charger in the market can deliver more than 40 watts to the Macbook Pro. 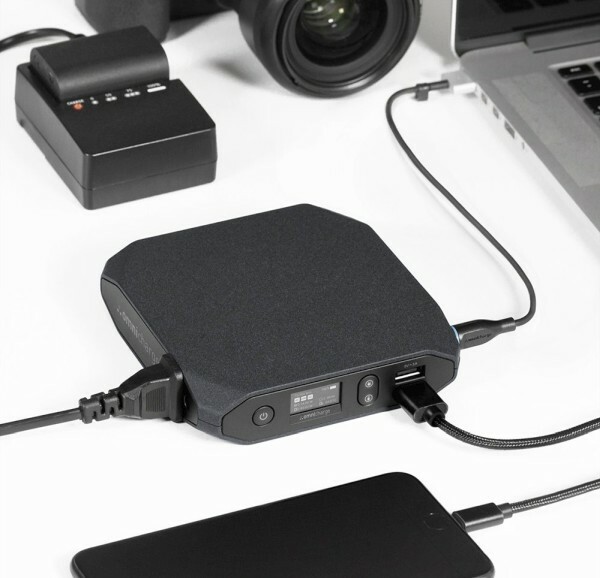 OmniCharge Omni 20 USB-C charges Macbook Pro at the maximum possible 60 watt speed. The OmniCharge Omni 20 USB-C weighs about 1.1 pounds and gets fully charged in 4 hours with any 45 watt PD USB-C wall charger. Both Omni 20 portable chargers also support passthrough charging, meaning you can charge the Omni 20 powerbanks while these are charging your laptops. 20100 mAh capacity charges most laptops once. A huge range of laptops can be charged. Multiple extra USB ports for charging smartphones.